Transmission Range: Up to 300 ft. Welcome to Tech Talk, a video series designed to help you find the information you need to know quickly and conveniently. Use the red play-head under the video to move to the specific time listed below. really like this unit. mine came as a refurb unit, like new and came with two displays. both displays have same indoor/outdoor temp and humidity readings which is a sign of accuracy. only compliant is poor viewing angle of screen. "Back light won't stay on"
My wife and I really like our lacrosse weather station, but today we ran into a problem. The backlight will only stay on for 10 seconds when I push the snooze/back light button on the top. All of the displays appear to be working, other than the light. Any suggestions, or is this just an issue with the technology? Thank you for your feedback. Please check that your AC adapter is plugged in tightly to the back of the display and the wall. The display is acting as if it was running off battery power only. We hope you find this helpful. If you need additional assistance please do not hesitate to contact Technical Support via the Support Tab web form link or contact them directly M - F 8 AM to 6 PM CST at 608-782-1610/888-211-1923. "Software Error: Indoor Humidity Sensor"
This is our 5th LaCrosse Technology product and overall we are please but we noticed a software defect. When the indoor humidity drops by more than 3%, the humidity trend indicator displays that there has been an INCREASE in humidity illuminates instead of displaying that there has been a DECREASE in humidity. In fact we have used the product for almost four months and we have NEVER seen the humidity trend decrease sensor illuminate. The other "problem" we noticed is that the Outdoor sensor displays "---" at least weekly for a 6-8 hour period even though the outdoor sensor's batteries are fully charged and the signal strength is normally very strong. Thank you for your feedback. The humidity trend indicators update with every 15 minutes and look back over the past hour. Change in humidity (3%RH). 1 hr comparison which changes on every 1/4 hour E.g. : At 1:00 - compare to 12:00 data; at 1:15 -compare to 12:15: at 1:30 - compare to 12:30 ….. etc Up Arrow: humidity has risen in past hour. Down Arrow: humidity has fallen in past hour. 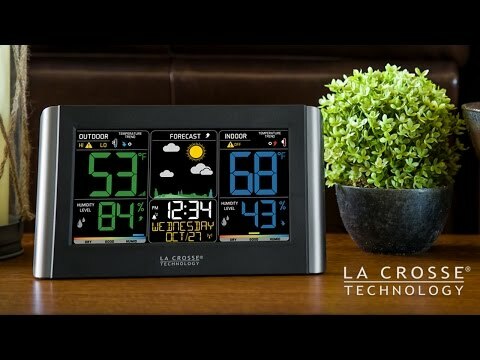 As for the Outdoor Temperature showing Dashes, assuming the batteries are good and there are no distance/resistance concerns turn the weather station 90 degrees towards the outdoor sensor to provide better reception. This allows more antenna surface to face the outdoor sensor signal. If that does not help please try a quick connect or factory restart. Full details on this can be found on the Support tab, in the FAQ's, on page 3.